In the evening the new deckhand arrived by the last plane. 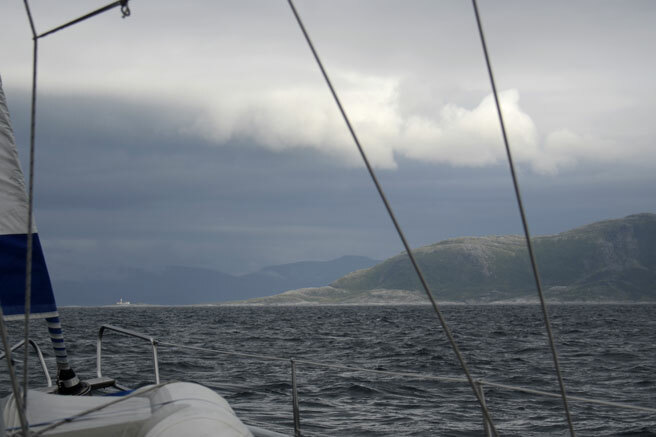 We wanted to go 4nm to Brønnøysund and wait out the weather until tomorrow and then sail the 50 nm to Rørvik, but the harbour in Brønnøysund was completely full so instead we went 30nm to Skeishamna! What shall we say? 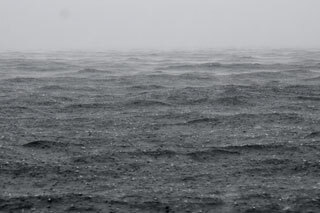 It was another day with headwind, rain and cold. No nice views as every thing was covered in the fog. No fishing - the sea was too rough. ...just nice to get to a safe harbour - turn on the heating and make some nice food! 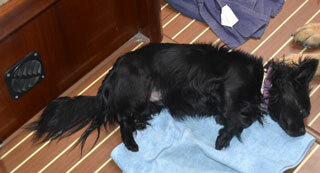 After a hard days sail - it nothing like a 5500W heater blowing you dry! Sunny when we got up this morning, but as you can see above - the next front is approaching - and surely when we left after stocking up with groceries and diesel it was covered up! 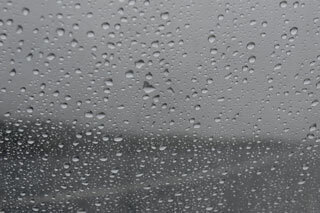 This view is getting too familiar - we now want 10-15 degrees more - and no rain please!! 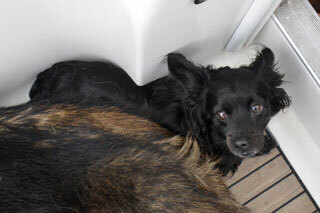 Not only is is cold and wet - I'm being squeezed into a corner too! 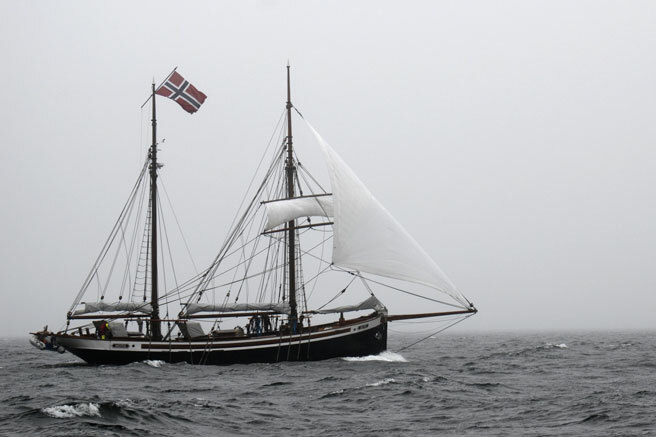 We met the cutter "Motig" on the way to the wooden boat festival in Sandnessjøen, just before we turned into Straumøya and we were all happy to get out of the rain and the seas and turn on the heating! 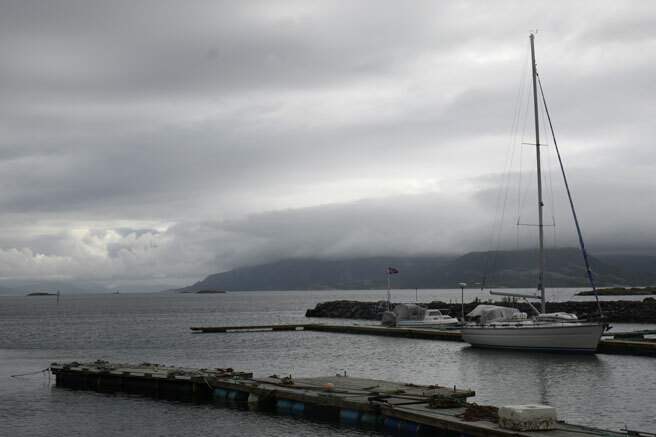 Even with the heavy seas outside it is calm in the harbour - thanks to the local boat club in Brønnøysund, which maintains this site! 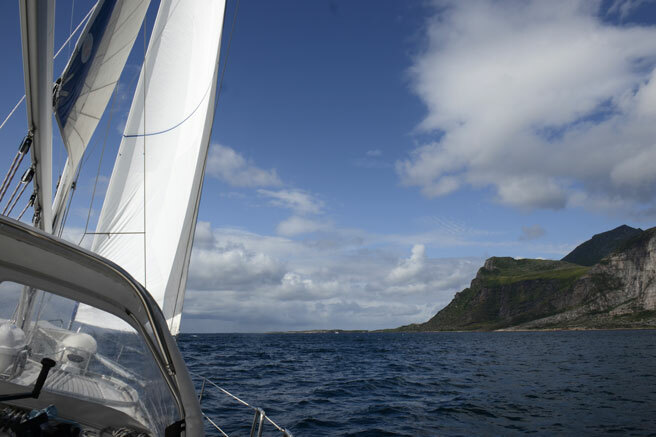 Nice sailing today - and - without any rain showers! 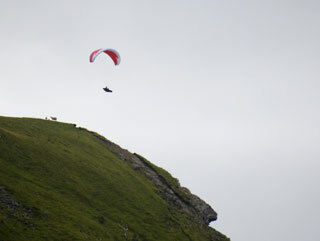 Today it rained - in addition to gusting S near gale. 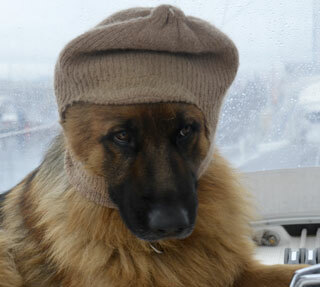 We sailed mostly on the navigation instruments and hid behind the spray hood as it was very cold. 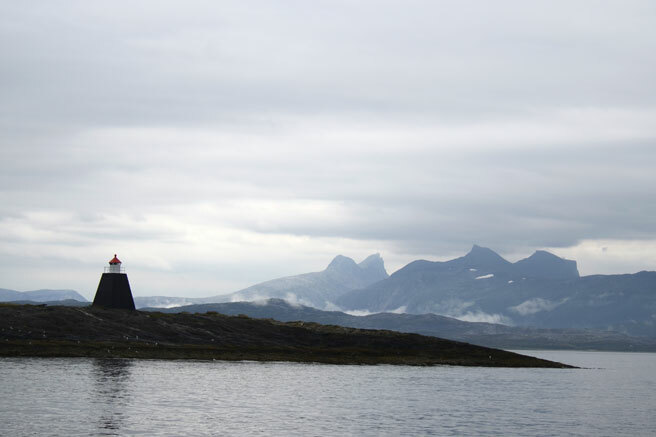 We passed the polar circle today, so we just hope that the arctic weather leaves us for now! 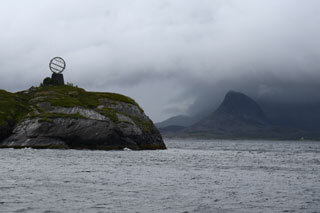 Above; the monument marking the polar circle is just outside Tonnes marina. Clover! - I simply love clover!!! 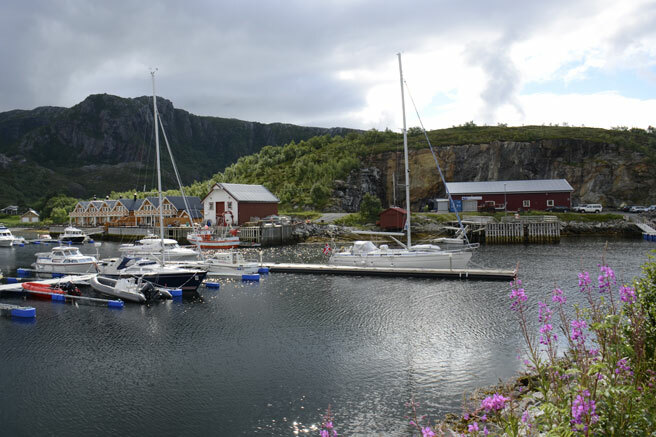 The marina is protected by breakwaters and has all the facilities. A quick walk from the harbour you can find a shop and a restaurant. 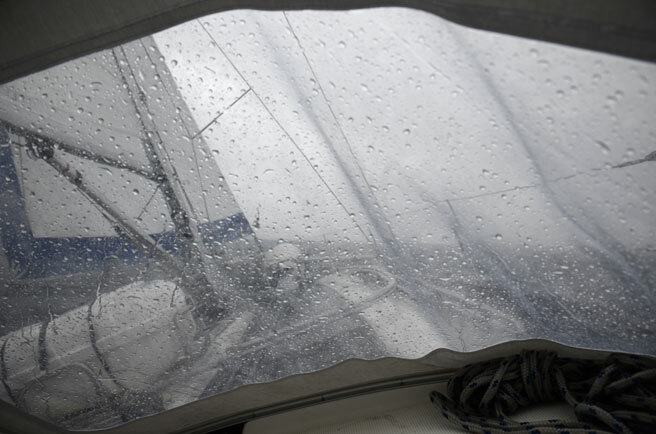 Tedious sailing today with a SW wind changing direction and gusting up to 16m/s - so we either had to change sail every 5 minutes or set the sails for the gusts and sail slowly the rest of the time - which is what we did. 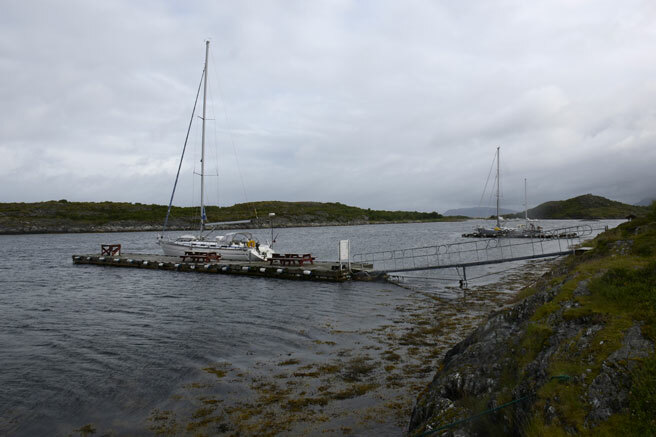 We had to set a mooring to the quay (left in the picture) to prevent the pontoon to drift off too far when the gale passed during the evening. 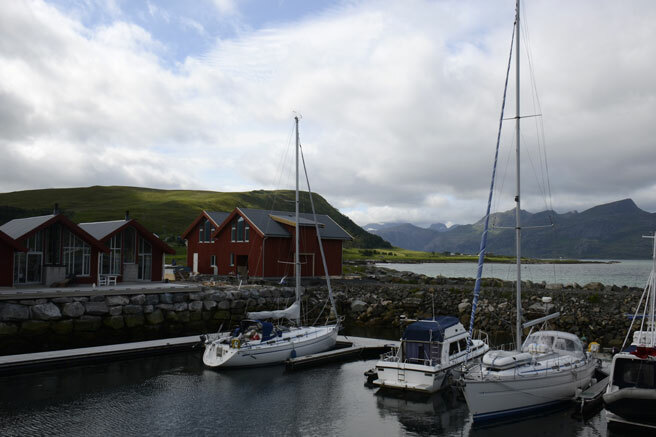 No wind when we left Bodø, but soon we had gale, rain and cold - so after just a couple hours of sailing we had enough and went to Krokholmen marina on Sørarnøy. The harbour is ok protected, but we still have 16m/s in here. In the evening, the sun came out for a couple of minutes! The harbour is well protected with power & water. 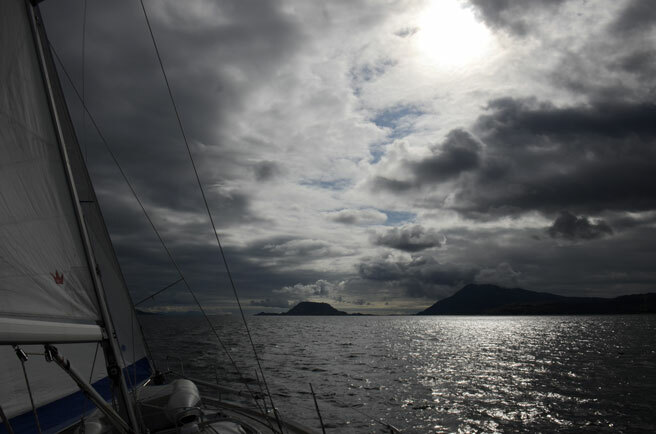 Left the harbour early to cross Vestfjorden, good wind from SW and moderate sea made the crossing comfortable, but cold. 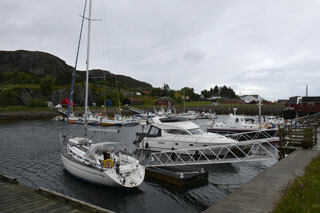 In Bodø, our extra deckhand left us and took the coastal steamer to Trondheim. 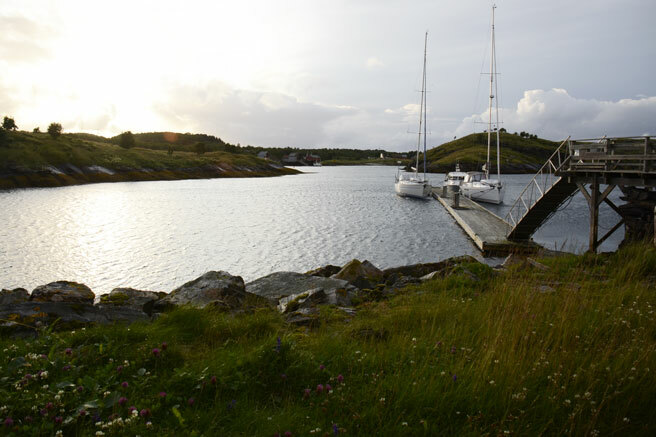 The harbour was quite full, but not many Norwegian sailboats..
As we are getting further south the midnight sun is is no longer with us - it drops below the horizon for half an hour now. Not that we can confirm this, as we haven't seen it for while! 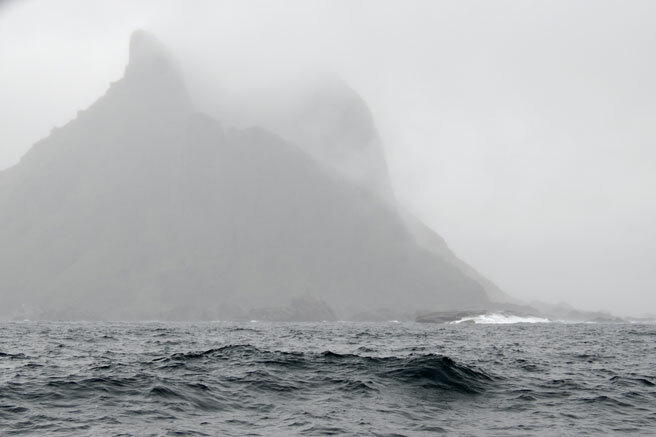 Below we are approaching the island Langegode. I'm sooo cold - when will we ever get sun again? Half of the day was spent mounting the new alternator and the relay, before we could cast off. Motoring south though Nappstraumen, we could wave to our friends soaring at the local flying site. 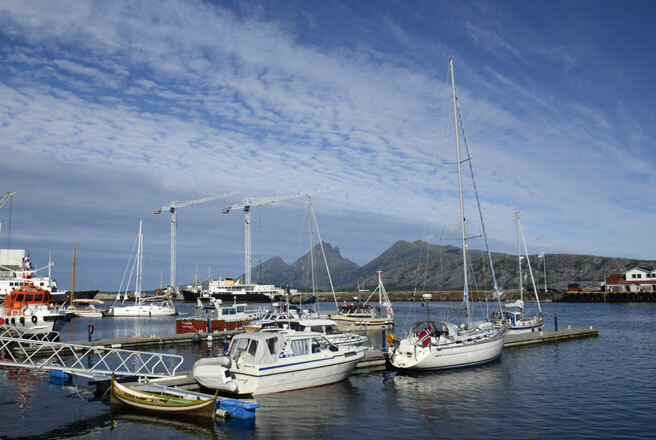 On the south side of Lofoten there was no wind, so the alternator was tested for some hours before we moored at the guest harbour in Sørvågen. With help from our friends staying at the marina, we had 3 trips to the local alternator shop to finally solve our charging problem; we now have a new 70Amps alternator instead of the old 55Amps and we have a 100Amps relay instead of a 70Amps battery isolator. 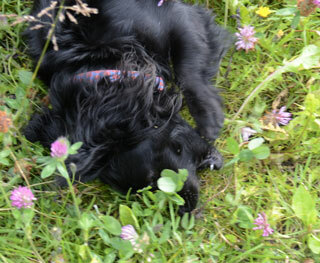 The morning was spent trying to repair our alternator, that died again a couple of days ago. Flåthens Elektro ran the alternator in their test bench and could confirm that the regulator was dead. After a couple of phone calls we found another workshop in Ballstad that would order a new regulator and we could probably pick it up tomorrow. 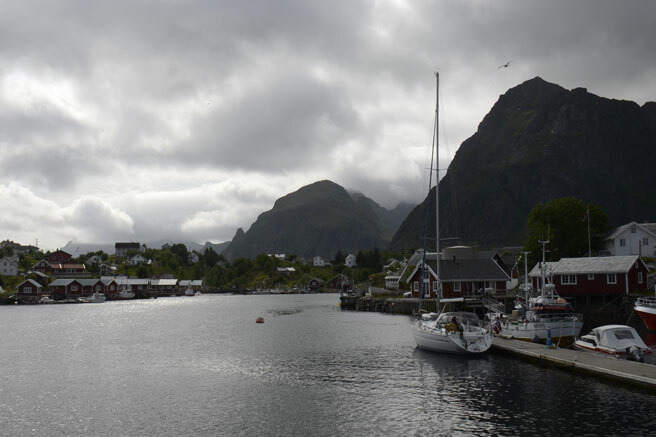 Second day along Lofoten and still no view of the scenery. 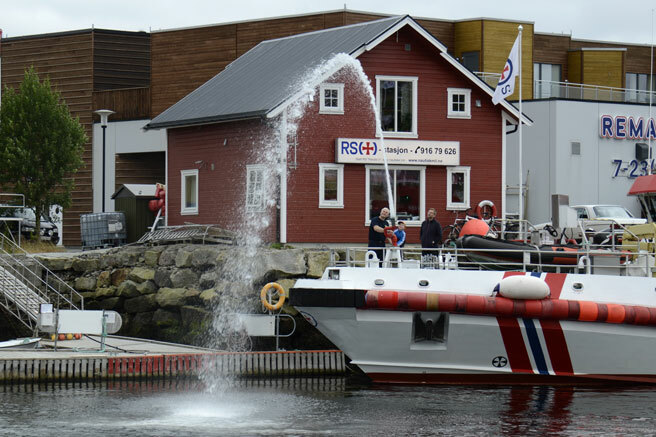 We had almost no wind and with still a lot of old sea 1.5-2m high, it was a very unpleasant trip on engine, but we had to go to visit friends and to pick up the new regulator. 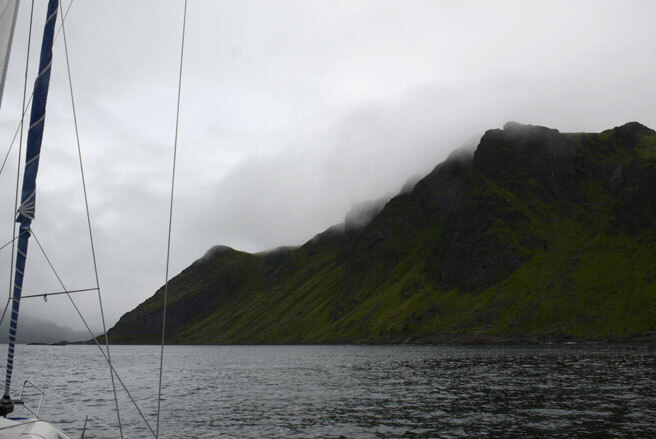 Passing the narrow sounds outside Ballstad the fog tried to lift. Once in Nappstraumen the fog lifted a bit so we could find the harbour. A 5 men strong welcoming committee were on the quay and soon after mooring we had a lovely dinner on land!